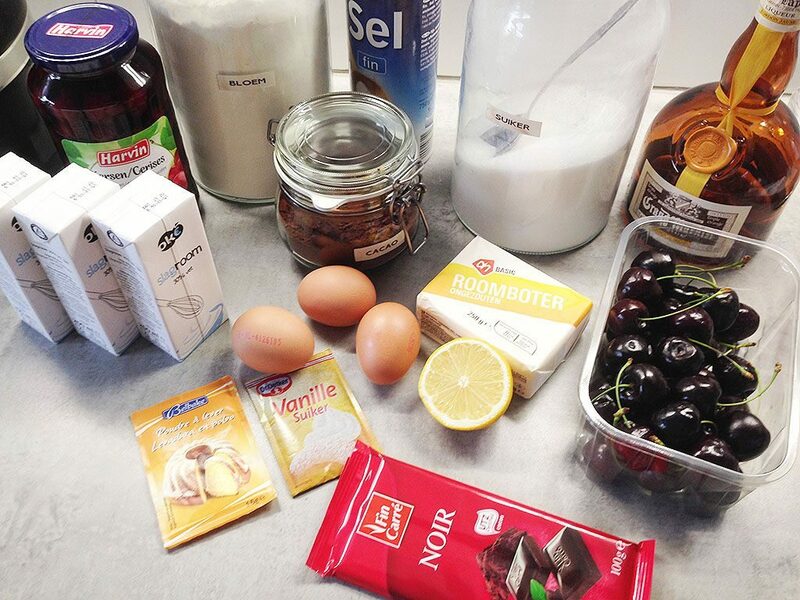 Classic black forest cake looks complicated but it's surprisingly easy. 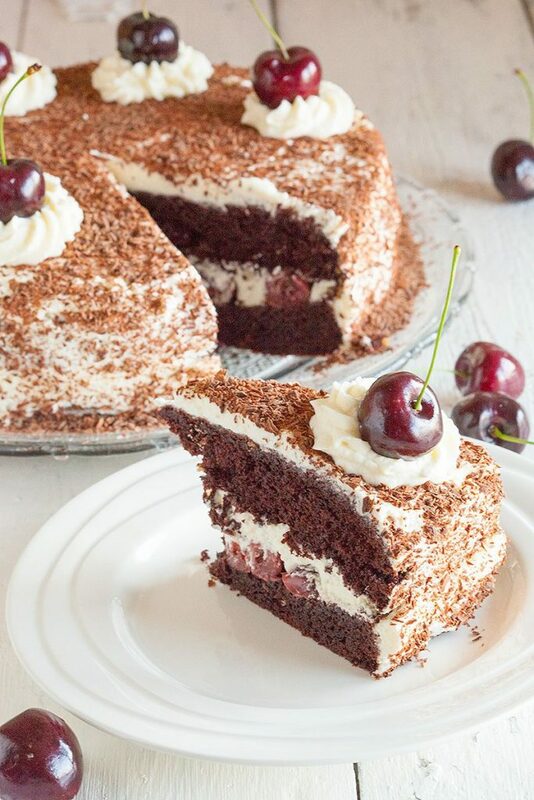 Basically it's a fluffy chocolate cake with cherries and whipped cream. Mmm! COAT the spring form with butter and a small layer of flour and set aside. DRAIN the cherries from the can or pot and save 100 ml of the cherry syrup. ADD that 100 ml syrup to the small saucepan along with juice of half a lemon, 100 gram sugar and about 20 ml of the liqueur. Let it simmer on low heat until it’s reduced enough and thickened until it’s a sticky syrup. COMBINE 6 eggs and 300 gram sugar in the bowl of your standmixer and mix on high-speed until it’s combined well. COMBINE flour, salt, cocoa powder, baking powder and vanilla sugar in a separate bowl. CUT the butter into cubes and add them little by little to the sugar and eggs. Keep on mixing to create a smooth batter and add the rest of the liqueur. Carefully ADD the flour mixture and combine them well using a silicone spatula to keep the fluffy texture. POUR the batter into the prepared spring form and bake for about 30 minutes, depending on your oven. You can use a wooden skewer to check the cake, when it comes out clean, the cake is done. Keep the oven door closed for a short while to prevent the fluffy cake from collapsing. Then TRANSFER to a cooling rack and let the cake cool off completely. WHIP up the cream with 100 gram powdered sugar and set aside. Use a bread knife to divide the cake into 2. 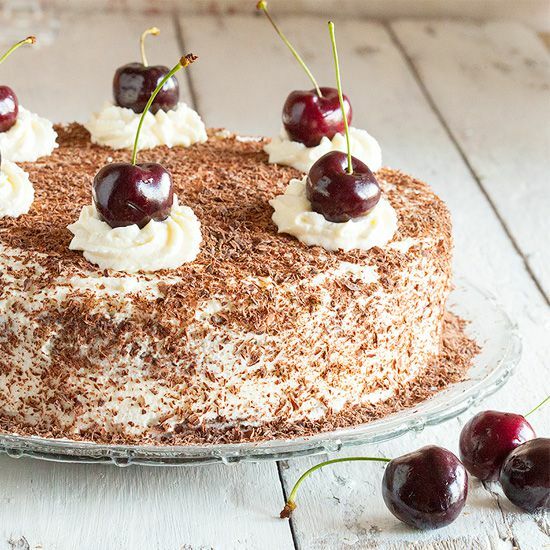 DIVIDE the drained cherries and cherry syrup over the bottom and top it off with a layer of whipped cream. PLACE the other half of the cake on top and finish it off with more cream. You can decorate the cake by adding some of the whipped cream in a piping-bag with star nozzle and add dots on top of the cake. 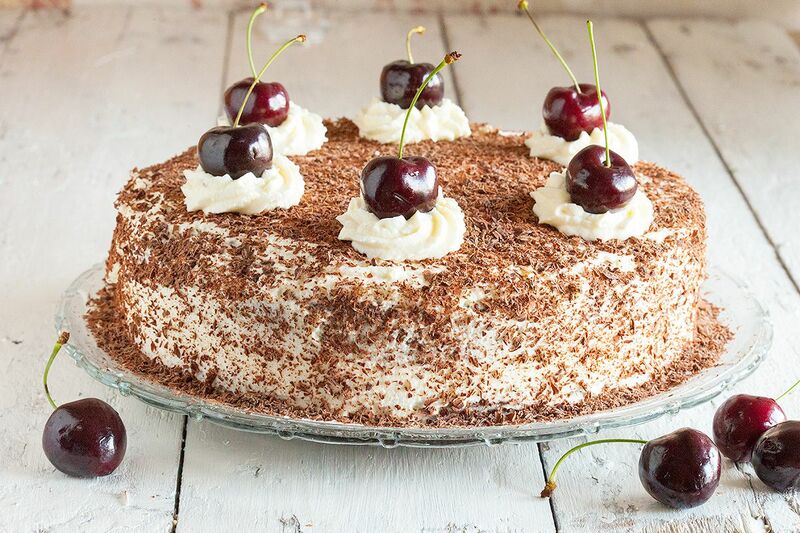 DECORATE the cake with chocolate shavings and fresh cherries, enjoy! One of my favourite cakes.